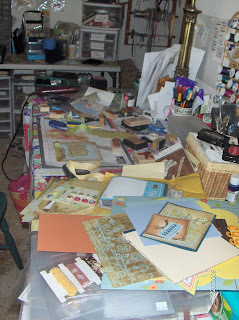 Welcome to My Messy Crafty Table! Life is a bit 'out of control' right now.. as you can tell by my crafty desk. I attempted to create something in between all the other duties of the day (bottle feeding lambs, entering sales data for the markets, prepping a ranch deposit, making dinner, refereeing homework, etc. etc. etc.). Oh yeah.. I also did some 'getting to know Mr. Expression! I also watched the EVER SO SNOOZEFEST DVD that came with the Cricut, to learn how to do everything.. OMG... talk about putting you to sleep! I had to slap myself to stay awake! I think I was too preoccupied analyzing the two gals' speaking abilities, their nails, and their wardrobe to stay focused... BUT they did mess up! My Mr. E was 'glued shut' with a clear sticky label.. and there I was trying to open the lid with two hands.. it just was not working... Until my 47 year old eyeballs caught the culprit! 2. What came in yesterday's mail???????? Hi, Andi! My desk looked like that until I spent two days cleaning it this week, so we can use it in another room over Memorial Day weekend! Ack! Okay I am guessing the Nature card and the new die cut. Although I see Anne guessed the same. :) I was anxiously looking for your Big Shot they promised you.